If you are looking for a solution to a difficult transport problem, or you simply need a more economical solution, STU may be your answer. STU has many benefits over existing or even other proposed transport solutions. Among many other benefits, STU systems have one of the very lowest construction costs, lowest operating costs and lowest environmental impacts of almost every other mass transport system. In its various configurations, STU systems can be installed as a high capacity inner-city system or as a high-speed cross-country solution. Because an STU system is installed above ground level, it eliminates most of the current safety issues associated with surface-level vehicles colliding with people, animals, or other objects. The elevated track system is a patented design that differs from any other track system. It is essentially composed of multiple steel cables tensioned between anchor supports (every 500 - 3,000 metres) and then encapsulated in a continuous steel box section to form the rail. The strength comes from the cables; the smooth ride from the continuous box section enclosing the cables. Single rail STU system tracks are usually 20 - 100 metres above ground level, while Dual Rail STU tracks are usually installed 6 - 10 metres above ground level. For single rail STU systems, the stations are medium to high-rise buildings that also serve as the anchor supports. The actual passenger platform is located at the top of the buildings, with access to the platforms via lifts. The buildings themselves can be utilised as office space, apartments, car garages, or just about any other current use of high-rise buildings. For dual rail systems, the stations are either independent structures or integrated into other buildings. The actual passenger platform is located about 6 - 10 metres above ground level. 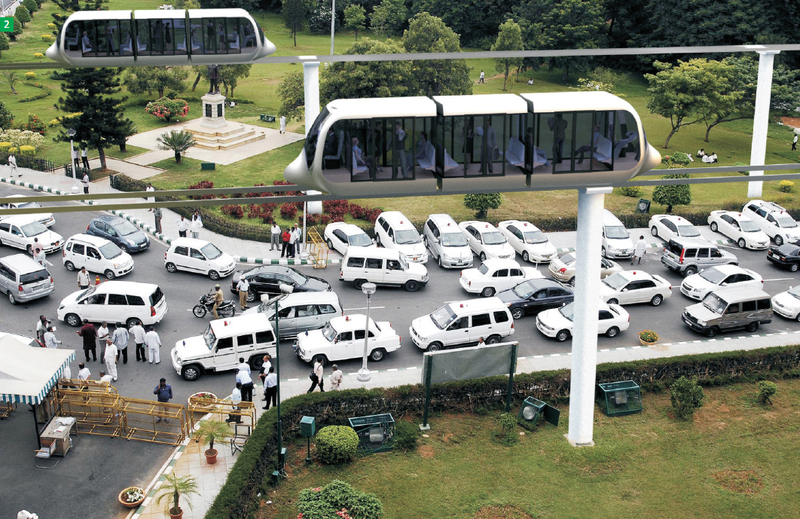 Several unique aspects of the STU system result in a vehicle efficiency that is far greater than cars, monorail, planes, trains or virtually any other transport system. Firstly the steel wheel / track interface has been developed to be twice as efficient as that of a train wheel (and 10 times better than a car wheel on a concrete road). Secondly, the elevation above ground removes a major source of wind resistance (the gap between a vehicle and the ground). Thirdly, the aerodynamics of the vehicle have been refined to produce an incredibly low wind-drag vehicle. To illustrate, a Porsche on the road has a wind-drag coefficient of 0.26, whereas an elevated STU vehicle has a coefficient of less than 0.1! Check out the Video Library to gain further understanding of the STU system. We have images of the complete STU system, from some of the range of vehicle types to passenger terminals, as well as close-ups of various parts of the system for the technically minded.